Radio MAX Music Loops: Construction Style Music Loops for Radio Pop & R&B Dance Music Production! DOWNLOAD Over 200 Pop R&B Dance Music Loops w/ Free Upload! 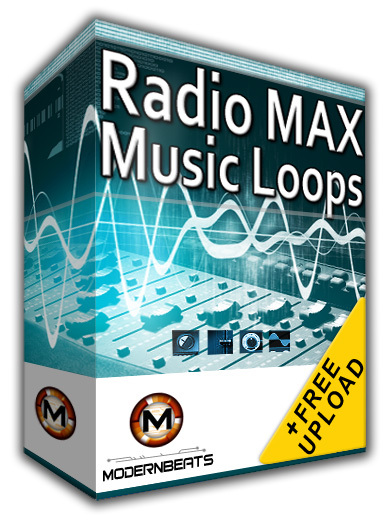 Download Radio MAX Music Loops 1 - Featuring over 200 loops in WAV/AIFF/REX2 formats (600+ files total) provided in a construction-style layout, ModernBeats presents "Radio MAX 1". Containing 10 multi-track themes, this melodic construction style loopset provides layered performances of modern Pop & R&B Dance music hooks, riffs, and licks. Each music instrument is separated into its own instrument loop file for full mixing capability & control. Note: For matching drum loops, see Radio Rhythmz Drum Loops. Radio MAX Music Loops 1 comes packed with a myriad of chart-topping Pop Dance and R&B Dance music performances! Plus, all music loops mix-match seamlessly together, allowing users to combine and create hundreds of original multi-track musical compositions with ease! Loops are modeled in the style of platinum Pop Dance music artists such as Lady Gaga, Black Eyed Peas, Rihanna, Chris Brown, Katy Perry, Madonna, Ke$ha, Beyonce, Kelly Clarkson, and more. Each 120BPM loop theme is featured in G major/minor key.